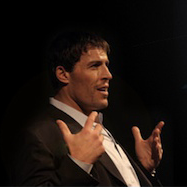 Experience legendary Anthony Robbins live and uncut for some twenty minutes at this years TED Conference 2006 in Monterey, Californa talking about our Six Humans Needs from ‘Human Needs Psychology”. This guy never ceases to amaze and inspire me with his endless passion and compassion for life. I agree with you Thomas, TR is truly an inspirational guy, changed my life a few years back when through his cd’s i gave up smoking. Been loving his output ever since. Great!